Alexander dressed for 14 games in 2018, all starts, and continued his transformation into an important part of the team’s defence. He finished with 36 tackles, three interceptions — tied for second on the club — while adding two forced fumbles, two fumble recoveries, four pass knock downs and five tackles for a loss. The emerging force and now a veteran voice in the Bombers defence agreed to a new two-year contract on February 12th, 2019 that would keep him with the club through the 202 season. 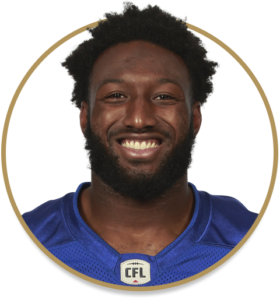 Made his CFL debut in the Bombers Canada Day win over Saskatchewan, finishing with five tackles and a tackle for loss… Finished the year with 52 tackles, including seven in two separate games – Sept. 30 at Edmonton and Oct. 21 at Toronto… Made his first career interception in the regular-season finale in Calgary on Nov. 3, returning it 56 yards for a touchdown… Was named the Bombers top rookie after finishing the year with 52 tackles, one quarterback pressure, two forced fumbles, four knockdowns, one tackle for a loss and one interception. A walk-on at the University of Central Florida, earned a full scholarship in 2012… Was a member of the American Athletic Conference All-Academic Team in 2013… Twice nominated for the Burlsworth Trophy, awarded annually to the college football player who began his career as a walk-on player… Attended the Atlanta Falcons training camp in 2015.